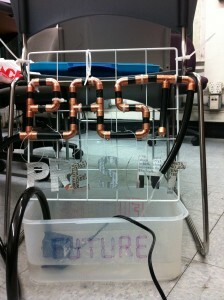 PPT Fountain Prototype 1 from Liza Stark on Vimeo. 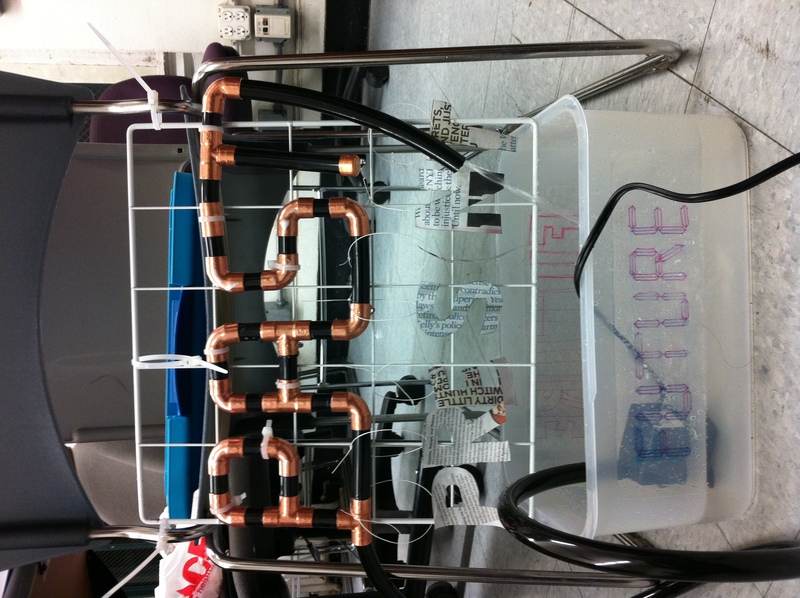 Conceptually, however, this water circuit/cycle configuration embodies the spirit of the narrative I want to establish: water circulates from the future up to the past, drips onto and dissolves the printed word of the present, finally finding respite in the transparent box of the future before going through the cycle again. 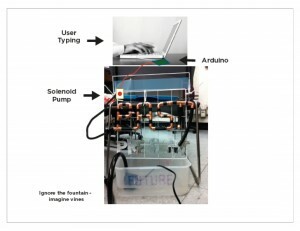 On another conceptual hand, there is not as much interaction between the user and the fountain as between the web and hardware. I am also vascillating as to whether or not I would like to focus this project specifically on WikiLeaks or as a general mediation inspired by CableGate. 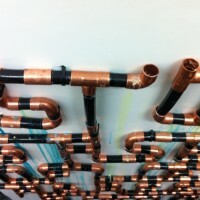 One potential conceptual and design solution is to place an independent container of water above the “past” and use a solenoid valve to release water into the pipes. 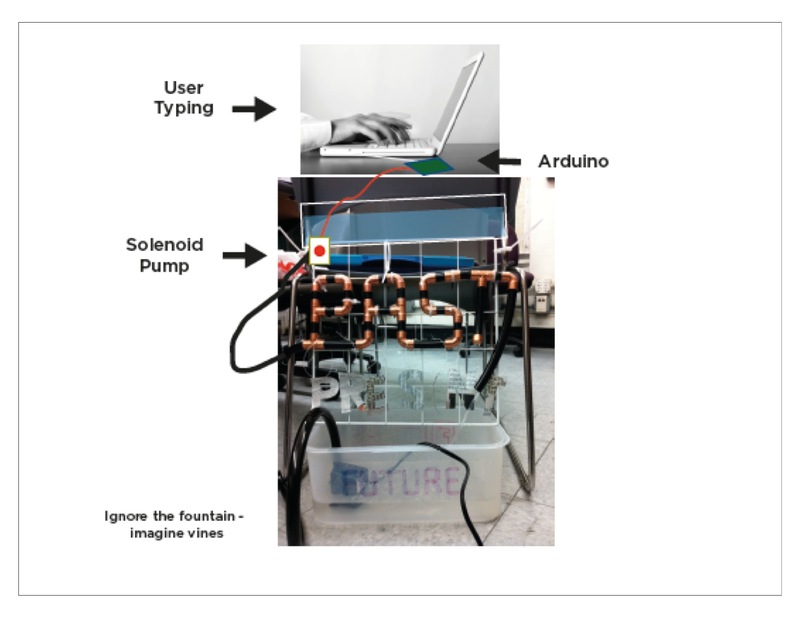 The trigger to release the water would be a sustained keypress: to release the valve, users have to type for at least 5 seconds, or enough to engage in some form of communication and the water will continue to flow as they type. For the interface they type into, it will either be an email or a comment documenting their response to a historical event or random question or their opinion of CableGate. Another possible solution that just struck me for the solenoid iteration would be to place a plant (I am thinking lots of vines) in the bottom (future) that would grow up the back and become wrapped up in the past. I really want to highlight the entangling relationship between the past and future that is unmediated by the present. 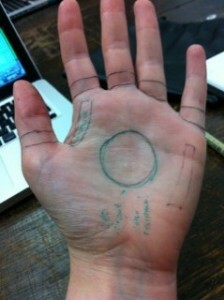 It would also make the association of cyclical time stronger as well. This also ties in quite nicely with the idea for the original analogy between water and data: both are flowing forces that require pressure and restraint to stop, both take many forms, and both (at least now) are essential to life. In essence, both are intrinsically generative and destructive forces; they can wreak havoc by bursting the proverbial dam or can irrigate and lubricate fields for sustained growth. History is a set of data agreed upon. Data gives us the illusion of temporal omniscience, whether in print book or screen database. 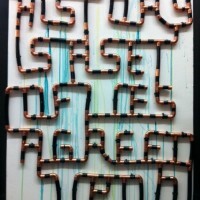 Words and numbers aid us in constructing our perspective of the past and its impact on the present and future. When that data becomes subverted later on, our historical narrative surrounding it is also called into question. For my final project, I will create an water-based installation that meditates on the cyclical and leaky narrative of history in a data driven age. 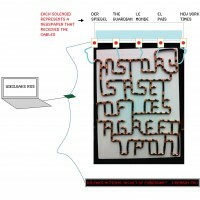 In an age of data, stored memory is altering traditional ideas of history. Technology is transforming popular perceptions of history as a static framework for examining relationships between past, present, and future. With the ability to create, communicate, store, retrieve, and recommunicate information, the lines of linearity are becoming blurred to engender a more cyclical, humanized paradigm of history. How can an analogy between water and data be presented in object form to conceptualize a narrative that addresses the fluidity of time-based events, ideas, and people within a historical context? 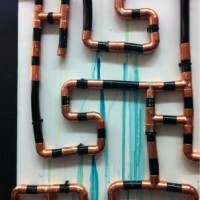 Further, what is the most effective way to illustrate the appearance of a cohesive system while highlighting the reality of their disjointed elements? My final project will be another iteration of our public space project, but the design question and concept will change to reflect the movement of the object into a broader space. In what ways does sound impact your relationship with your immediate environment? How can an individual experience their normal environment in a profoundly new way? How do people experience a personal relationship with an object? How does sound define an object? How can sound desystematize environments and behaviors associated with them? All of the objects drawn will be placed on a glove. I am still debating what type of fabric will best work for this type of project and that will not interfere too much with the vibrations emitted by the object. On the left, we have the back of the hand/glove that will house the speaker and two LEDs indicating on and off states. A headphone jack will allow users to plug into the object that they are “listening” to. 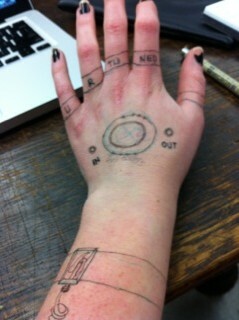 On the right is the front of the hand/glove with the piezo disk. It’s a long, exciting, sleepless era ahead. stay tuned! 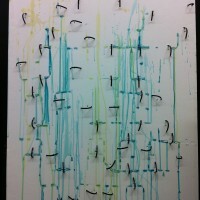 The third prototyping test was a bust. We had constructed a speaker to attach to the contact mic and amp, but once we hooked everything up, the speaker was not loud enough to hear any type of noise. This could have been for a variety of reasons, from wear of the contact mic to a lose connection. Not to be deterred, we instead walked around the bridge for another round of sonic observation to determine the acoustics of the sounds coming from the cars below and the construction closer to the Brooklyn side. We found that the sound environment changed as we passed through the first tower, with the sweet spot of transformation occurring just as you walked past the tower: here the static and muddiness of the combined noise decreased significantly. We also more closely observed the connection between heard and felt sound. That is, you wouldn’t expect to hear individual footsteps on the bridge, but the wood planks of the path give enough that you can feel them move as people walk on them. Within the acoustics of the bridge, these individual sounds of walking become audible over the wind and cars due largely in part to feeling the wood move. A third observation that was the most fascinating from a behavioral point of view was the manner in which people chose to cross or not cross the bridge. 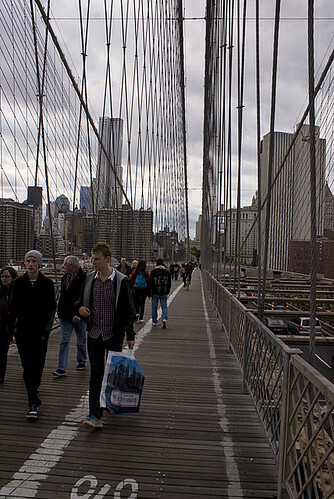 We had been speculating what tourists would do when confronted with the mass expanse of street to travel once they arrived on the Brooklyn side – would they actually cross all the way or would they turn around and come back to Manhattan once they reached the middle or end of the bridge? We divided people according to their goal for coming to the bridge, a division that correlated highly to the distinction between locals and tourists. We were working under the assumption that the majority of tourists would consider the bridge a destination, a place to knock off the list and to take in the entire city. Locals tended to actually cross the bridge, using it for either transportation from working Manhattan to home in BK or vice versa, and as a means of decompression or perhaps better put, a way to scale themselves against the city, or from habit or exercise. We made a point of watching specific groups of people as we prepared and crossed, noticing about eight different groups of tourists returning to Manhattan. For the moment, we are putting this observation away , but it was an extremely interesting find that we hope to integrate into further iterations. We decided to use headphones instead of a speaker; it is a much more intimate way to accomplish our goal of having people hear the bridge and interact with their surroundings. Initially we had thought about focusing only on the locals. We justified this with the idea that tourists as outsiders generally experience a heightened sense of awareness in a new and exciting environment. After speaking with Victoria, however, we decided that we are not going to differentiate between an audience, or focus on engaging one more than the other: if the bridge democratizes, we certainly don’t want to infringe on that lovely side effect and alienate one group by focusing on a specific population. 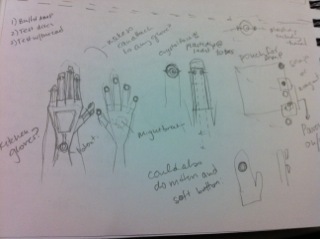 Here sits the presentation Caitlin and I gave for our public space project on the Brooklyn Bridge. In observing the use of the space, we were interested in the idea that after a certain vertical point, the majority of the bridge is physically unused, though still essential for structural purposes. We were enamored of the idea of using this structural space – especially the steel cables – as a location of engagement and interaction. 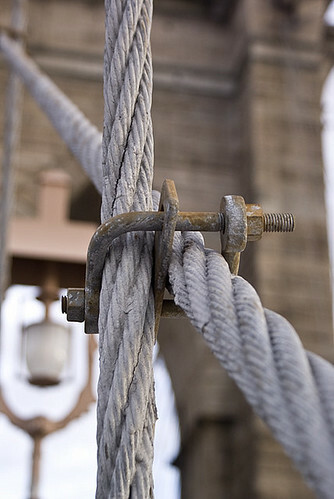 As we were especially excited about the subtle sounds of the bridge, we have been discussing the idea of coupling a sound input source like an enhanced contact microphone to these cables, allowing people to amplify and become aware of the constant vibrations that all the elements of the bridge – pedestrians, bikers, automobile traffic, wind, weather – are creating. 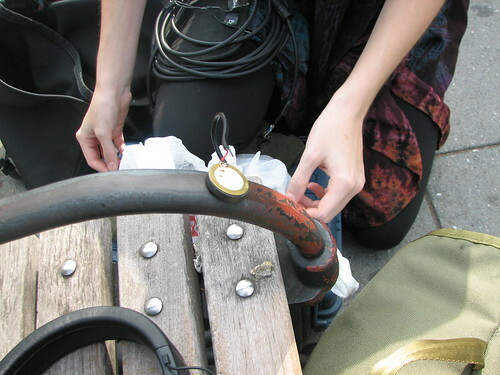 We would like to do some tests involving attaching microphones to the bridge cables with magnets, allowing them to be moved around and giving the impression that one is “playing” the bridge like a musical instrument. We’re also interested in the idea of using small vibrating motors, also on magnets, so that a group of people could interact by “playing” for each other. 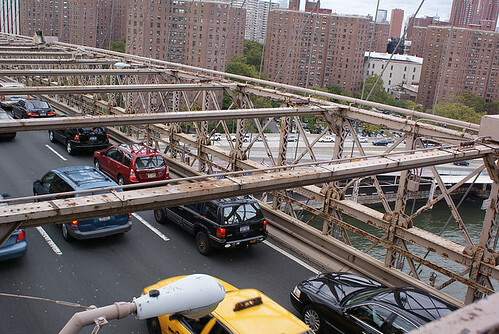 The sound created would therefore be a vertical connection through the bridge, which is not usually accessible: the traffic below would be creating the most significant vibration, the people on the pedestrian level could make smaller-scale changes, and the entire thing would be enacted by the vibration of the cables above. Another theme that we were very interested in was the presence of photography on the bridge. Since so many people are taking pictures, it’s interesting to wonder what the composite view of everyone’s photos must be, or whether people can relate to each other through their photos. We were also interested in the play between light and shadows that the cables create – perhaps we could have some kind of visual puzzle where passersby need to interact with each other to merge different photographs or create a certain outcome. We’ve also been discussing using these ideas of light and photography to trigger the sound piece as described above; the motors could start vibrating at a certain time of day when the sun is shining, or could react to the flash of a camera. We began our journey in search of public space with three sites in mind: the Silver Towers, a residential complex for NYU faculty members; the Brooklyn Bridge; and Eastern Parkway in Brooklyn near the Franklin Avenue subway stop. We chose these three for their diversity of environment, both geographically and structurally. Silver Towers is an odd paradox of stark, industrial architecture punctuated with intimate family activity. Built in the 1960s, it consists of three Soviet Brutalist style complexes forming an open box around a grassy island. 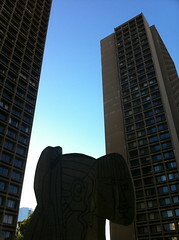 This green space is the obvious focal point and houses a very large, imposing statue created by Picasso. A driveway runs the perimeter of the green space and to close the box established by the buildings is a wide sidewalk with a ledge for sitting a green space behind that for play (but not for dogs). The entire complex felt cold, and children were generally the only ones who interacted with the space outside of its prescribed boundaries. As an exercise in observing and analyzing public space, these factors made it a great place to start, but in the end we decided that the character of the space was more conducive to observation, largely due to the hermetic nature of the space; namely, that it might feel too forced. On a minor note, we also thought the inhabitants (or their security force) might not see our endeavors as enriching the space. Next we took the 6 train down to the Brooklyn Bridge. Both of us were immediately inspired by the opportunities and challenges working in such a space would involve. There are a few characteristics of bridges as a general symbol that were immediately appealing to both of us: bridges connect two separated spaces; bridges are thresholds from one place to another; all types of people use bridges (whether driving, walking, or biking); bridges must economize horizontal space; bridges have the capacity to facilitate a distinct type of connection between an individual and other people (an intimate friend, passerby, or cantankerous biker); individual and him/herself; an individual and the immediate space of the bridge as a structural environment (the trusses, the cables, the cars passing underneath, the people walking by, etc. ); an individual and the passive space of the background, namely the two places the bridge unites and the landscape in between. In a word, bridges are inherently liminal spaces, in between spaces, and very powerful in their capacity to stimulate interaction. Their uses are multifarious, serving as spaces for transportation, personal reflection, social interaction, and more. This liminality also serves another function, deeply necessary for the above relationships: it offers the individual a sense of scale, both in space and time. 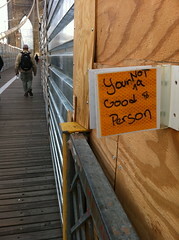 also interesting is the recent controversy surrounding the BK Bridge Park art vendors (http://gothamist.com/2010/10/01/brooklyn_bridge_park_1.php). We had not had the pleasure of walking the bridge recently, which in retrospect was key for the experience we had while crossing. Stepping up to the foot of the bridge, we were immediately surrounded and passed by a diverse crowd of crossers. As we continued walking, a few distinct characteristics and behavior patterns emerged from the group: almost everyone was taking pictures or recording video, no one paid attention to the bike lane, bikers become very upset at this, people stopped at various points along the path for sight-seeing, picture-taking, inspecting a historic marker, etc. Individual groups or couples tended to form larger groups at a few locations that seemed ideal for picture-taking, especially places which captured both the skyline and the bridge towers in their focal plane.